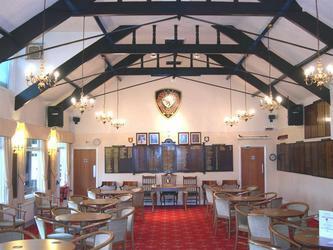 Worsley Golf Club is looking forward to welcoming you on your special day. We will make it a perfect day for you! Here in our beautiful black & white timbered period Club House we will provide the perfect setting for your wedding, christening or party celebration. 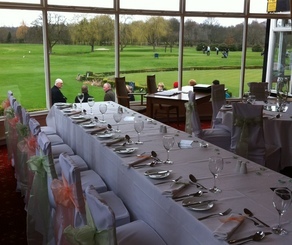 If you wish to choose a formal seated meal, we can cater for a maximum of 100 guests. Our Wedding Menu offers an excellent selection of fine food accompanied by a choice of quality wines. Should you select a Buffet Menu, for your evening function, then a maximum of 130 guests can be accommodated. For evening celebrations you can dance the night away with your guests on our dance floor. The Club House and grounds provide fantastic photographic opportunities and there are also extensive parking facilities for you and your guests. Whatever your catering needs Darren our Catering Manager and Paul our Head Chef and the team will work with you to create your own menu or help select from one of our own. Whatever you decide, together we will create a day to remember. In addition to the Full Wedding package, we also provide a package for Evening Parties and a Christening package, all of which you can tailor to suit your requirements. Please contact Darren or one of the staff for further information regarding these packages.